This is a French Sonora Excellence…Model 301…as you can see on the left side of the dial in this photo. It’s Bakelite case measures a large 18″ wide, 11″ high & 9″ deep. 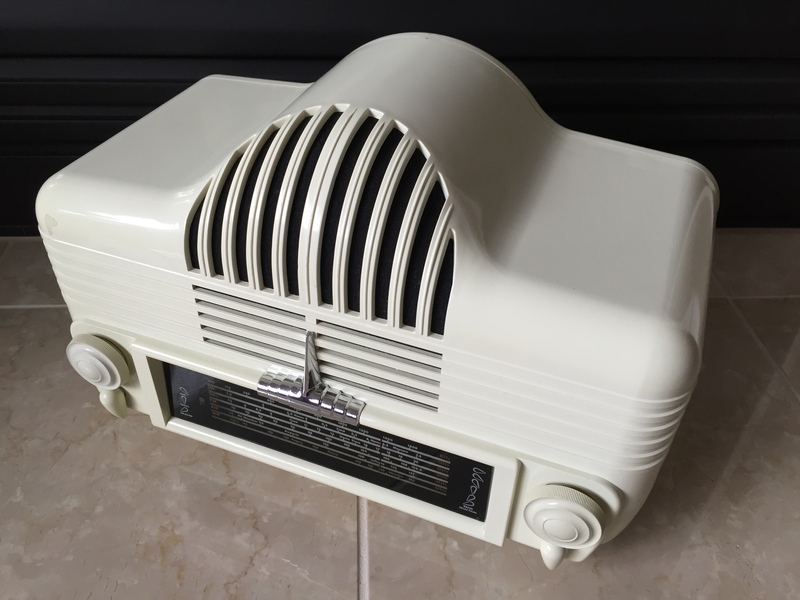 According to the books “Radio Art” and “Bakelite Style”, the Sonora was designed in the United States, produced in France, and is nicknamed the “Cadillac”, because of the look of the large grille. Most articles say this Sonora was produced starting in 1947, with production continuing into the 1950’s. There is also a version of this radio that has a tuning eye as part of the dial display, Model 302. The most important aspect of collecting for me is the design of the radio case. The Sonora Excellence really delivers…the rounded corners, the dramatic grille, the sweeping horizontal lines, the touch of chrome, and more. The Bakelite allows for the intricate design. A Catalin case would never have this much detail due to the molding and hand-shaping restrictions. But, the Bakelite is also a negative, because so many of these radios have Bakelite that has been damaged over time. They tend to look dull and dried out. I pulled the above image from Google as a “best” example…not dried out like many of them. These Sonora radios normally sell in the $500 to $1,000 range. I haven’t bought one of these yet, because of the poor condition of the Bakelite on the ones I’ve seen for sale, and because of the large size. For comparison, the largest Catalin radio is the RCA 66X “Tuna Boat”…which is 15-inches wide (3-inches smaller than the Sonora). So, what can you do when you love the design? 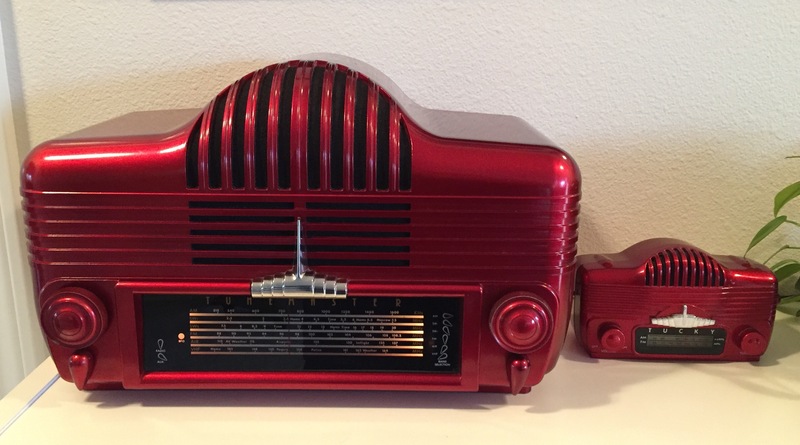 Above are two reproduction radios…Tunemaster SM 950’s. They are still fairly large…13-inches wide instead of 18-inches. 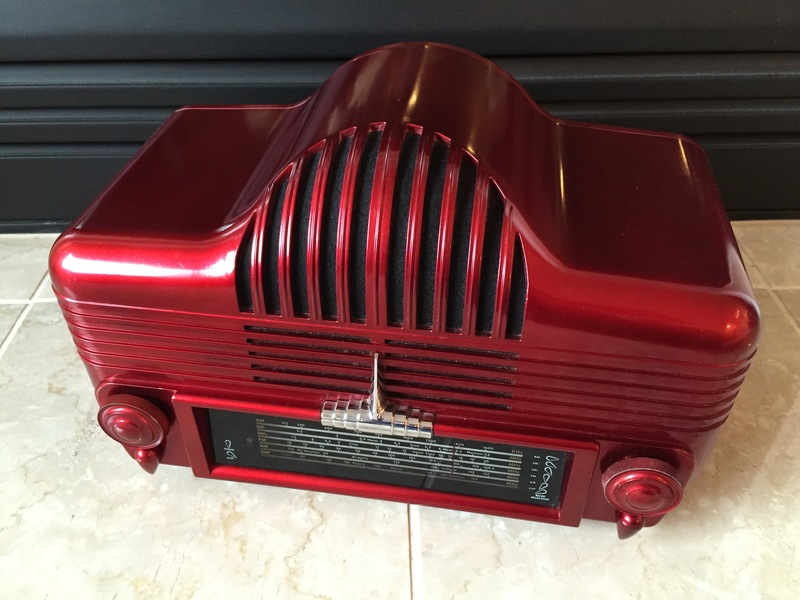 The Sharper Image company was looking for a design for a high-quality table radio. According to the owner’s manual, they spotted the original Sonora in a catalog for a Japanese exhibit of Industrial Design. Naturally they loved the design, and decided to use it for a modern 7-band radio (AM, FM, VHF, Shortwave A & B, Aviation, & Weather). On the back, it has full-size RCA inputs & outputs, jacks for headphones and speakers, shortwave & FM antenna connections, a BFO switch, a tone control, and a fine-tuning control. Not a cheap knock-off! There’s not a lot of concise information about this model available, but it was apparently made in 1989, and priced at about $300. 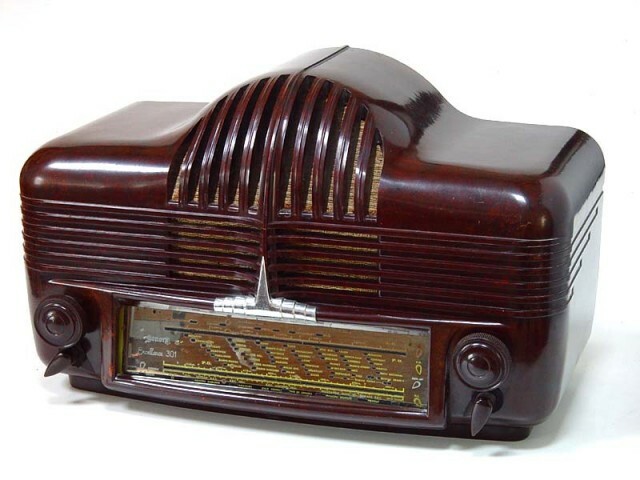 Everyone knows it’s best to not play the true vintage radios of the 1930’s and 1940’s on a regular basis. The reproduction of the Sonora allows me to use it daily to listen to my favorite stations. It certainly has good sound, and it fits right in with the display of the “real” radios in my collection. Oh, and the “Tucky” mini-radio works good too! Note: Real & Reproduction Part 1…is quite a few articles below, on page 2…and was updated in April, 2016.
there are two model numbers. The 301 had the tuning eye while the 300 (as shown) did not. After making the above comment, Wade double-checked his Sonora Excellence (it has a tuning eye), and found that it is the model 302. So, it appears model 301 does not have a tuning eye, and model 302 does. I have one of the white reproduction models which plays well. It has quite a few bands on this radio. I do use an external antenna which helps with the shortwave and other bands. I know little about this radio other than I bought it used in very good condition. It is a very unique design and one I like. This is also a reproduction radio that looks good with the vintage radios I have and most people would never know the difference. The original Sonora’s of this model must be quite beautiful in their polished Bakelite. However, if this radio ever develops any problems, I would have trouble finding someone who could work on it, as there seems to be little information regarding the schematic and so forth. I just keep my” fingers crossed”! As I have one of the white reproduction Sonora Radios (and also a wooden Addison 5 radio), looks like we have a similar appreciation for the varying designs of radios over the years.